11:30 a.m. – American Legion Post 46 holds wreath-laying ceremony at Conway Veterans Honor Roll outside Kennett Middle School. 12:00 p.m. – American Legion Post 46 holds raising the colors, military gun salute, and laying of a wreath at the Conway Village Cemetery on Washington Street. 1 p.m. – Veterans will meet at Mineral Springs Rehabilitation and Retirement Center to honor veterans there. 1:45 p.m. – American Legion Post 46 holds wreath ceremony at the courtyard cemetery at St. Margaret of Scotland Anglican Church on Pleasant Street in Conway. 2:30 p.m. – light lunch buffet for American Legion Members and the Public at Post 46 on Tasker Hill Road. Bartlett VFW and Post 95 head from Jackson Village Cemetery to Intervale cemetery on Route 16-A. Bartlett VFW and Post 95 travel to Glen cemetery for a small march. 11:30 a.m. – Procession at Bartlett Village near the Fred Hodgkins Veterans Park at Josiah Bartlett Elementary School. General Public served lunch at Bartlett Congregational Church. For more information, call Louis Lavender, Francis P. Murphy VFW Post of Bartlett, at (603) 356-9490 or American Legion Post 95 Leader Post Commander Jim LeFebvre at (603) 356-7296. 9 a.m. – Parade begins and travels to Jackson Village Cemetery with participation from the Jackson Grammar School Band, the Bartlett VFW and American Legion Post 95. 8 a.m. – American Legion Post 46 holds a ceremony at Lyman cemetery on High Street in Silver Lake. Parade following Gilman Cemetery ceremony ending at the veterans memorial at Madison Town Hall with a flag ceremony, rifle squad salute and playing of taps. Madison Fire Department offers a community breakfast by donation at their station. 11 a.m. – Memorial service on the front lawn at the Ossipee Town Hall put on by the Rodney H. White VFW Post 8270. 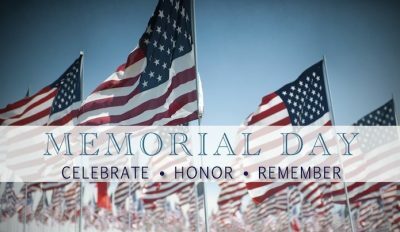 12 p.m. – A Memorial Day Observance will be held at the Tamworth Veterans’ Memorial at the junction of Main Street and Routes 113/113A. 1 p.m. Parade starting at Legion Hall on Bradley Street in Fryeburg. The parade will travel to Bradly Park for another memorial service. For more information, call George Weston at (207) 935-2567 or (207) 890-6062.